Apple's laptops were historically the first to come widespread with webcams integrated into the screen frame. Apple started shipping these cameras (dubbed "iSight") integrated into the screens of the MacBook and iMac around 2005, and have been a staple feature in nearly every product they have shipped since. Now when you look around, you can't really find a laptop of any brand without an integrated webcam. They are an essential part of the computing experience. But as the iPhone has led the pack in camera optics and technology in a small package, none of that love has made it back to the Mac. If you buy a (standard) iMac or MacBook Pro today, you'll get a 720p FaceTime camera. Meanwhile the iPhone is boasting multiple lenses, Portrait Mode, FaceID, and shoots at 4k. 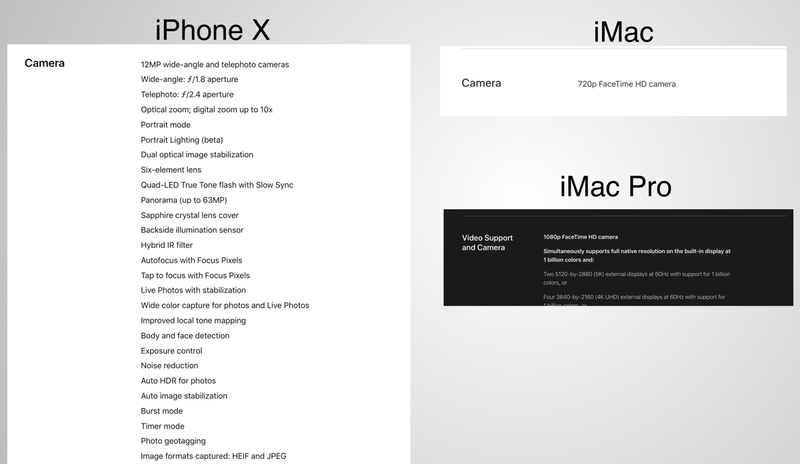 It gets even more embarrassing when you look at the Tech Specs for the iPhone X versus today's iMac under the Camera category. Granted, the iMac Pro (which will be released on 12/14) has bumped up the camera to 1080p, but I think this is more attributable to the cost of this part decreasing rather than Apple's intent on making the Mac's camera truly first-class. And yes, I hear you... nobody is asking for Portrait Mode on the Mac 1, and some of these features only make sense in a phone (such as image stabilization). But Face ID? That's a perfect fit. Face ID would be hands down way better than Touch ID on the Mac. (pun absolutely intended). In addition to having better optics, the sensors are better, which allow for more light at lower ISO levels. In other words, it would work better in low-light situations and have a less grainy feel overall. Think of what this would do to FaceTime on the Mac. Or the increasingly common person who works from home and attends meetings remotely, often with the camera turned on (👋🏼). These experiences get notably better with better quality cameras. 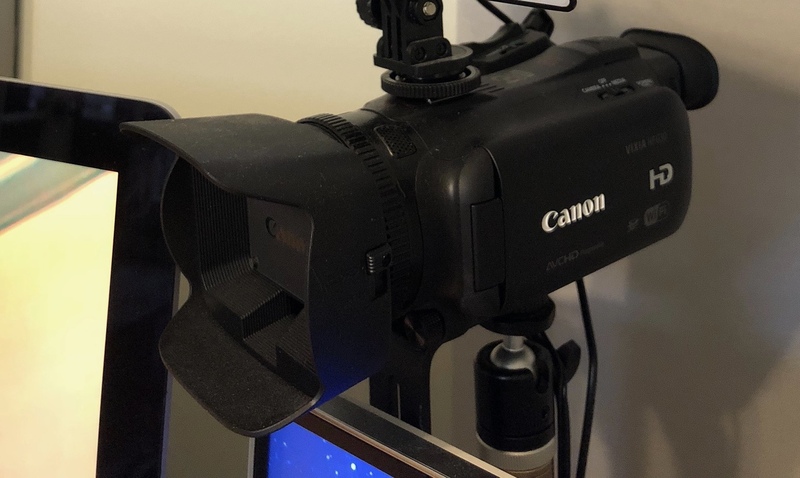 Since I've been doing more and more video (and because the iMac camera is awful) I invested in an HDMI capture card and have been using a Canon Vixia HF G30 (1080p / 60fps) camera as my webcam when joining meetings. People always comment on the quality of the picture. Remember back in the day when Apple was bold enough to put the Apple logo "upside down" on their laptops? The genius of this was that the logo would face upright when the lid was open, exposing the awesome produce you are using to the people across from you in a coffee shop. It was for them to enjoy and envy. Better FaceTime cameras on the Mac would do the same, and they are long past due. While recording an episode for NSScreencast, in which I reload rows of a UITableView while scrolling, I noticed that the scrolling acceleration would screech to a halt.